"Broadway will hear a new generation of songwriter in 2006 when Adam Schlesinger of the pop group Fountains of Wayne pairs with lyricist David Javerbaum, the Emmy Award-winning writer of TV's "The Daily Show," for the new musical, Cry-Baby. Like Hairspray before it, the show (as previously announced) will have a libretto by Tony Award-winners Thomas Meehan and Mark O'Donnell, and is based on a film by John Waters. A spring 2006 opening on Broadway is projected. 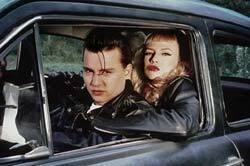 In the 1990 movie, which has class-clash as a theme, a good girl representing the rich "Squares" in 1954 Baltimore is attracted to a motorcycle-riding, leather-clad bad-boy (then played by Johnny Depp), a member of the "Drapes" ‚Äö√Ñ√∂‚àö√ë‚àö√Ü from the other side of the tracks."